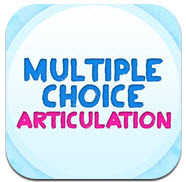 The Budget SLP: Multiple Choice Articulation - APP GIVEAWAY! I don't have to have my own version of Erik X. Raj's app Multiple Choice Articulation to know that elementary and middle school boys would love this app. And, face it - most of you have caseloads made up of primarily boys. I'm not being biased, but I was a "listening" carpool mom throughout my children's school careers and while the girls might like it, the boys will love it. Questions, such as What would you rather have – a rhino horn growing out of your face or a rat tail growing out of your rear-end? Why? and What kind of sandwich would you rather eat - a sandwich that fell on the floor or a sandwich that a fly landed on? Why?, will definitely get your students interested. This app gives opportunities for numerous repetitions of the target phonemes in structured sentences and spontaneous speech. With over 500 questions, I could see using this for several sessions and know that students would ask to repeat the lessons. Although designed for articulation, this is a great app for language therapy. Use to practice answering and asking questions and forming sentences. Once students get the hang of it, have them create questions with their science or social studies vocabulary. Read Erik's blog. He has a lot of good ideas that will get your students thinking and talking. To win the app, simply comment or like my Facebook page using the Rafflecopter below. You are the winner! I've sent you an email. Enjoy! Looks great! Thanks again for such a great blog! This app looks awesome! Great reviews. Thanks for the chance to win. This looks great, I know a few boys on my caseload that would love this. Just found your blog. Looking forward to the budget ideas. I have to control myself or I would spend my whole salary on therapy tools. I would love to try this app out! I have been reading the reviews for this and would love to use it! Looks awesome! Would love to win!! I love your blog! you always have great ideas! I would love to try this app out!!! I have been reading up on the reviews for this app and would love love love to win!!!! I have been reading the reviews for this app (looks great because of use with speech and language) and would love love love to win!!! I would love any opportunity to support my speech students! I would love to win! I would love to win this for my child! !